Exhibition launched by Ruairi Quinn, T.D. Minister for Education and Skills at 6pm, Tuesday 18th February 2014 at NCAD Gallery. 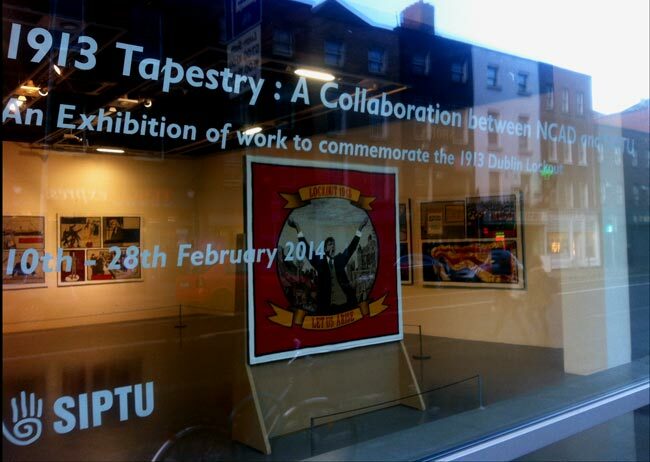 The 1913 Tapestry is the outcome of an ambitious collaborative arts project, led by NCAD and the trade union, SIPTU. In early 2012, the two organisations commissioned artists Cathy Henderson and Robert Ballagh to design the tapestry and work with community groups to create 30 panels for it. Over the past two years, the artists – along with staff and students from NCAD – worked with more than 200 volunteers from 30 different community organisations to create the tapestry panels, which tell the story of the Lockout in graphic images. The volunteers included teachers and pupils from five Dublin schools; prisoners from Mountjoy and Limerick prisons; members of the Irish Countrywomen’s Association, the Irish Guild of Embroiderers, the Irish Patchwork Society and RADE (Rehabilitation through Art, Drama and Education); trade union activists; and community arts groups. Since it was unveiled by President Michael D. Higgins last September, various elements of the tapestry have been exhibited in landmark Dublin buildings, including Liberty Hall, Collins’ Barracks and the Abbey Theatre. This month’s exhibition at NCAD marks the end of the Lockout 100 years ago, and will see the entire 1913 Tapestry on display. The completed tapestry is comprised of multimedia textile pieces, laid out in comic-book style, with each panel measuring 60cm x 76cm (2ft x 2.5ft). At the NCAD exhibition, a narrative explanation will be displayed next to each panel, detailing who was involved in its creation and how. A number of ancillary events will take place at NCAD over the coming weeks to complement the exhibition. These will include a play by RADE, "A Hundred Years Ago", in the Harry Clarke House Lecture Theatre and a public talk on cartoons from the 1913 Lockout. “A Hundred Years Ago” will take place at 5.30pm on 20th February, and is open to the public, free of charge. It is based on original writings and is delivered with bawdy humor that includes both jaunty and haunting ballad songs. A cast of 8 non-professional actors from RADE will perform, accompanied by professional musicians. The public talk on cartoons, 'Political Cartoons and the 1913 Dublin Lockout' takes place in the Harry Clarke Theatre, NCAD, Wed 26th Feb 2014 at 5.30pm. It will be led by James Curry, Digital Humanities Doctoral Scholar in Modern Irish History at NUI Galway, and a specialist in historical Irish political cartoons. The session will be chaired by Felix M. Larkin, a specialist in political cartoons in Irish history, who will facilitate discussion and participation on the topic. NCAD Gallery, 100 Thomas St, Dublin 8. Opening hours 1pm - 5pm, Mon – Fri. Free Admission. Image: 1913 Tapestry exhibition installation view, NCAD Gallery. The work of young people involved in the Tapestry was recognised in an event in the college on Tuesday 9 April 2013. The work by the pupils of Mater Dei Basin Lane primary school, Larkin Community College and St. Louis College Rathmines was displayed in the college. Certificates were presented to each of the participants by the Director of NCAD, Declan McGonagle and the National Campaigns Organiser of SIPTU, Ethel Buckley. The event was organised by NCAD Access Officer Finola McTernan and the work in the schools was managed by NCAD Researcher Angela Keane. The NCAD Tapestry initiative is led by Dr. Gary Granville, Faculty of Education.